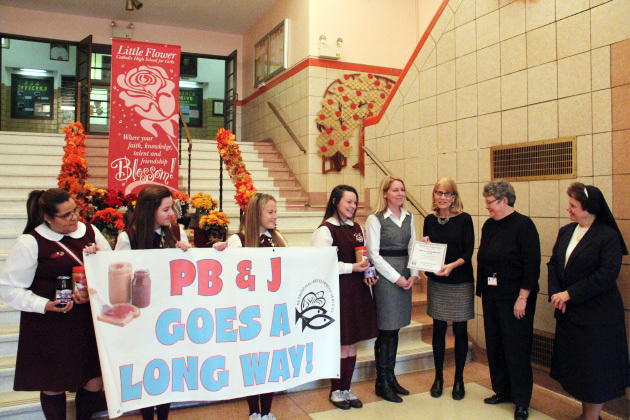 Nutritional Development Services (NDS) celebrated the successful completion of its 2012 Peanut Butter and Jelly Drive in conjunction with archdiocesan schools and outreach programs on Friday, Nov. 16 at Little Flower High School in North Philadelphia. 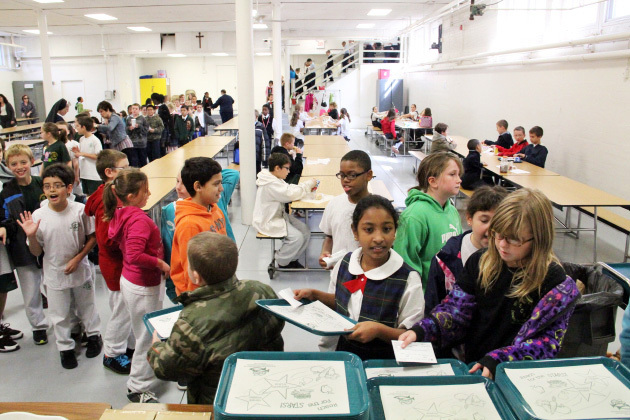 The agency of Catholic Human Services provides meals, food assistance and additional support to organizations serving children and the poor as an extension of the mission of the Archdiocese of Philadelphia. Students presented NDS the peanut butter and jelly collected by their school. 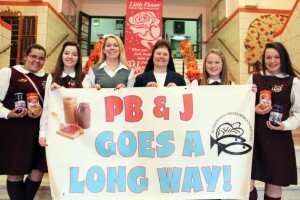 More than 65,000 pounds of peanut butter and jelly have been collected throughout the Archdiocese since Sept. 10. 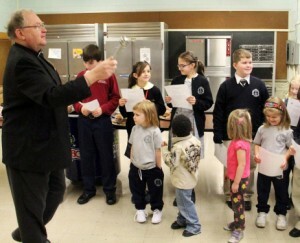 NDS marked the start of its School Lunch Program Nov. 7 at the newly formed Blessed Trinity Regional Catholic School in Philadelphia with a special blessing of the program in the school cafeteria. 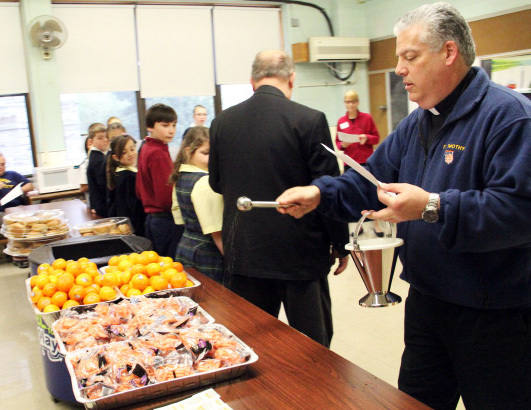 Father Stephen Leva, pastor of St. Timothy Parish, and Father Joseph Zingaro, pastor of St. John Cantius Parish, were on hand to bless the students, staff, food and equipment. 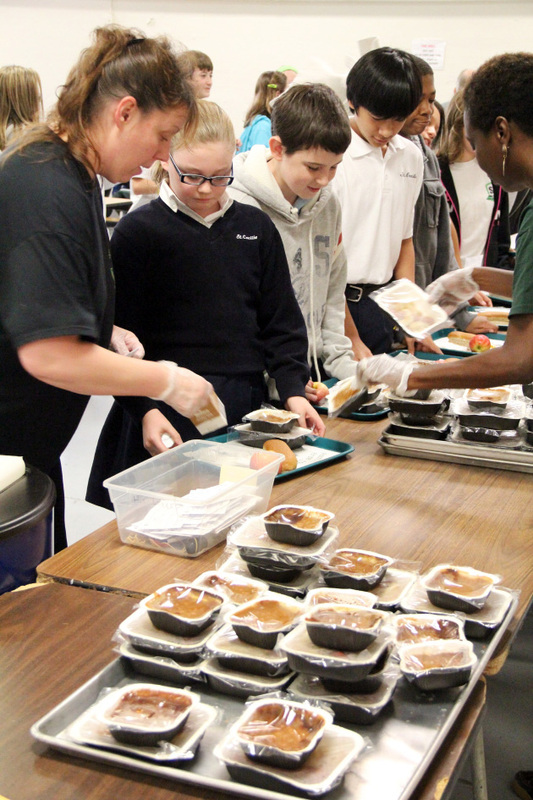 NDS provides healthy, affordable meals to students attending more than 100 Catholic, charter and private elementary schools throughout Southeastern Pennsylvania’s five counties. The meals are funded in part through the U.S. Department of Agriculture. 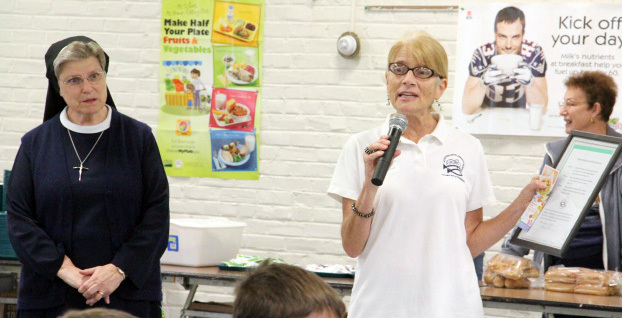 St. Cecilia School in the city’s Fox Chase section was the site for a special day marking National School Lunch Week Oct. 18. The school is one of the newest partner sites for NDS. Students received nutrition puzzles, coloring sheets and stickers to remind them of the importance of eating healthy at school and at home. A proclamation celebrating National School Lunch Week was read at lunchtime in the school cafeteria. 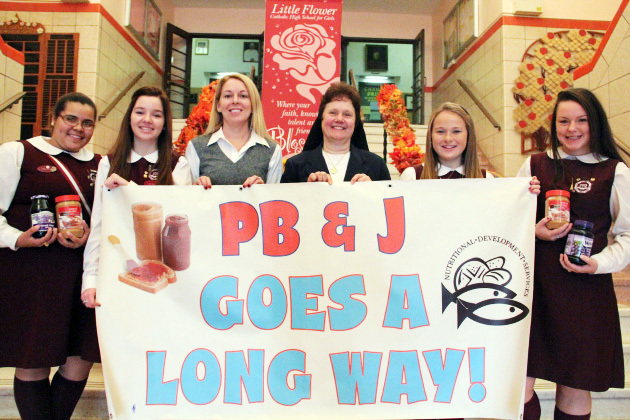 Ashley LaTorre, Hailee Vance, Brooke Hauer (CSC moderator), Sr. Donna Shallo (President), Mary Kate Walsh and Colleen Donnelly are proud to support Nutritional Development Services in their collection of peanut butter and jelly for people in need. Anne Ayella, NDS Assistant Director for Community Relations, and Denise Hopkins, NDS Administrator for Community Food Program, present Brooke Hauer and her students from the Community Service Corps of Little Flower with a thank you certificate for all their hard work. Mary Kate Walsh (junior), Hailee Vance (senior), Ashley LaTorre (senior) work with Community Service Corps president Colleen Donnelly (senior) pack boxes with peanut butter and jelly that they collected for those in need. 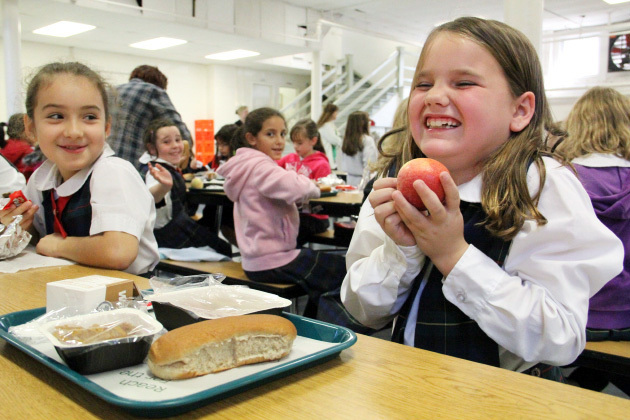 Students at Saint Cecilia School in the city’s Fox Chase section make healthy lunch choices, thanks to archdiocesan Nutritional Development Services. Anne Ayella presents a proclamation to the principal, Sr. Jane Mary Carr I.H.M., of St Cecilia School during National School Lunch Week. 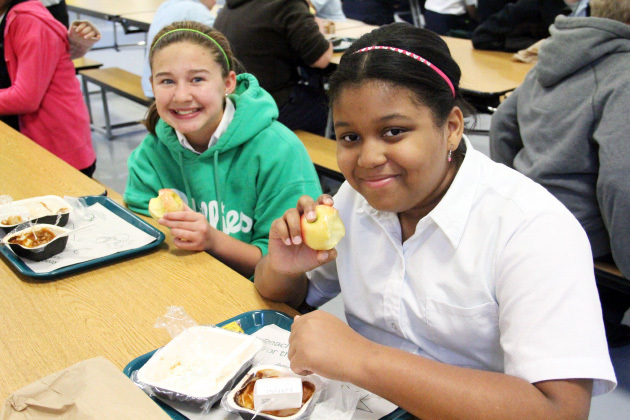 Students enjoy their meals provided by NDS at St Ceclila School in the Fox Chase section of Philadelphia. Students at St Cecilia School in the Fox Chase section of Philadelphia are enjoying the new lunch program that has been added to their school thanks to NDS. Third grader Bryanna Cunningham enjoys her apple during lunch as Saint Cecilia School in the city’s Fox Chase section. Fr. 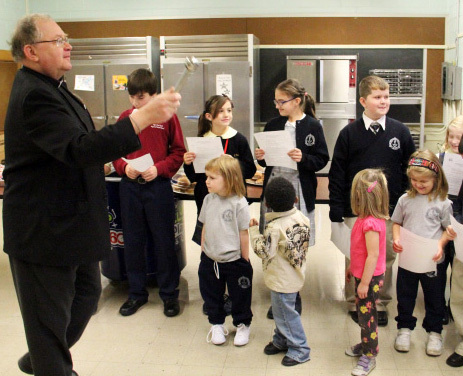 Stephen Leva, pastor of St. Timothy Parish, blesses the food that students at Blessed Trinity Regional Catholic School are about to enjoy for lunch. Fr. Joseph Zingaro, pastor St. John Cantius Parish, blesses the student of Holy Trinity Regional Catholic School as part of the blessing of the lunch program and all those involved. Fr. Stephen Leva, pastor of St. Timothy Parish, and Fr. Joseph Zingaro, pastor St. John Cantius Parish, give a final blessing at the service to bless the student lunch program at Blessed Trinity School that is provided by NDS.